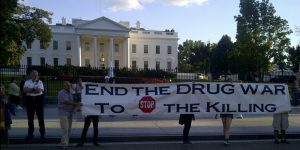 Ending the Drug War is a priority for Global Exchange and the social movements we work with around the world. The reasons are simple. The war on drugs has not reduced drug use, but it has created a violent, militarized and politically powerful underworld. The cost of this war is measured in hundreds of thousands of deaths, millions of people incarcerated, and more than a trillion dollars spent since 1971. 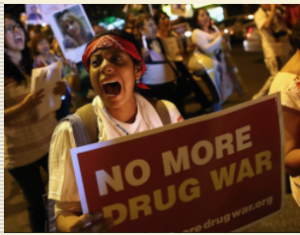 Drug prohibition policies are a primary driver of crime, murder, and corruption in Mexico, Central America, and the United States. In recent years we’ve witnessed a gradual shift in opinion toward drug policy and criminal justice reform — as the futility and cruelty of the drug war became ever more obvious. This trend toward sanity and compassion has the support of a growing majority of the American people, but is threatened by the vindictive tone and erratic course of the new Donald Trump administration. Over the last six years, we have organized big beautiful caravans which have created platforms for civil society actors — students, community and religious leaders, journalists, teachers, artists, poets, workers, medical professionals, and so many others — to support victims of drugs and violence from Mexico, Honduras, El Salvador, Guatemala, Colombia, Canada, and the United States; and to powerfully speak out together against the drug war and the carnage it has institutionalized. In 2017 the Caravans will rise again. We invite you to help us engage people in conversation in towns big and small across the United States. Our next caravans will go way beyond just ending the drug war. We plan to generate discussion, visibility, and direct, personal engagement on critical global issues in places where these issues are not often discussed.